After years of searching for my paternal grandfather's Gwizdowski family, from Gwizdów, Podkarpackie, I found that the name is assumed and he was actually born Bzdziuch. I've expanded my search to include towns within about a 25 mile radius. Basically, going through page by page, record by record through the scans available at http://szukajwarchiwach.pl/search?q=Gwizdow%20XSKANro%3At. Their listings in the Gwizdow record books seem to begin around the mid 1870's and, after about 1909, there are no records available. I wonder if they migrated to Gwizdow, about the time they first appeared in the record books, from some other area. Geneszukacz lists the highest concentration of Bzdziuch in nearby Lubelskie parish of Puszcza Solska, but those records seem to be microfilm records at LDS, but those don't seem to be available. It is likely that there are some other online resources that I am not aware of? What I'm looking for are some ideas from those who have more experience of where I might look next. I keep thinking there are resources out there that I am just not familiar with. Any ideas and suggestions are greatly appreciated. Thank you! LDS no longer provide microfilms. They make available scanned images, some public internet, others can only be viewed at your local Family History Center. The catalog shows these latter items with a key above a camera image. This applies to the records of Puszcza Solska. These Centers also provide free access to a number of paid subscription sites such as ancestry and myheritage. a whole bunch of stuff that has no images. And yet, there is one interesting detail. One of the items on the list is "Spadek po Agnieszce Bzdziuch (Gwizdowskiej) z Juchów." Maybe your ancestor was a Jucha, not a Zucha. Sophia...wow! You've gotten me to open up my eyes and squint harder! 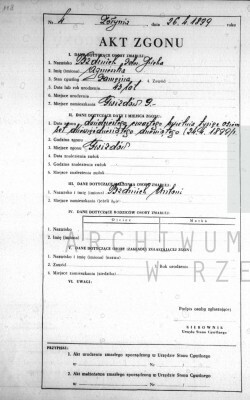 Here's grandfather Jozef's birth record...So is it Zucha, or Jucha/Jochow? I think you are correct, that it is the later and I was not squinting hard enough. So is the reference translated as The deceased Agnes Bzdziuch (Gwizdowski) from Zuchow? Is Zuchow a place, or a maiden name? 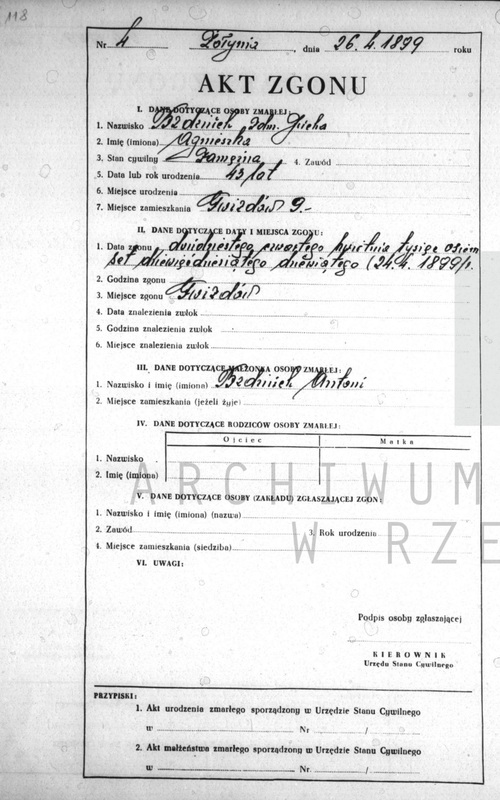 I've seen numerous other scans of Bzdziuch records where an alias is used, such as Andreas Bzdziuch alias Wos. If your find is my g.grandmother, it's the first time I've seen the names Bzdziuch and Gwizdowski tied together. I have a death record for Agnes which I've attached and, now that I squint on the maiden name, it is certainly a J and not a Z. Is that right? I'll have more questions, I know, but thank you for helping me turn over another rock to look under! Gilberto...this is a terrific resource and will keep me busy running searches. Thank you so much for the tip! Thanks, Henry! There is a History Center here in Warrenton, VA which I've tried to catch when they're open. I'll have to pursue this again! In both the birth and death records that you just posted, the surname is Jucha. So you can cross "Zucha" off of your search list. If it helps, when you see the phrase "Agnieszka Bzdziuch z Juchów" you should read that as Agnieszka Bzdziuch nee Jucha, or if you prefer, Agnieszka Bzdziuch (maiden name Jucha). The "z Juchów" part of it is like saying "of the Jucha family" where the word family is understood. It appears to me that the death document you posted is the very same thing that the archive is listing.